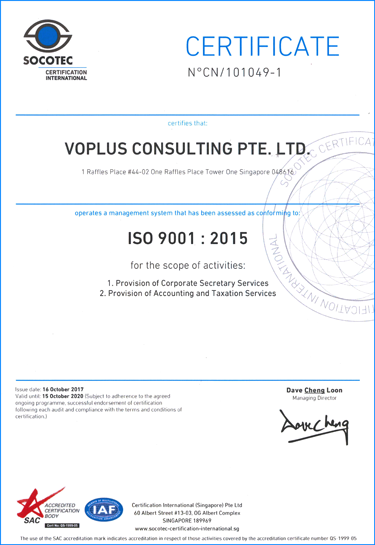 We are pleased to announce that VOPLUS is the first corporate services provider in Singapore to be ISO 9001:2015 certified. With this certification, we have implemented a more systematic approach to serving you and managing your business, and will strive to continuously improve our service quality and processes. One of the most recognised global benchmarks, ISO9001: Quality Management System is a certification that ensures a quality management system is implemented in our company's daily operations. It is the most prestigious standard in the market, and is based on a set of quality management principles as such a strong customer focus, the motivation and implication of top management, the process approach and continual improvement. The certification verifies that we have the ability to deliver efficient and quality services to our customers through a new and improved process. It is a pledge to you that you will always get systematic, consistent and quality services from VOPLUS and its subsidiaries that will meet all your expectations. It also means that as customers, you are assured that our services are safe, reliable, compliant with regulatory requirements, and of international standard. What does the certification mean to you as a customer? Its equipment and facilities are in working order. As your corporate services provider, our certified processes and procedures will be extended to your business, thus ensuring even higher efficiency in your operations. Being ISO 9001 certified is one of the many initiatives we have planned to fulfil our vision and mission, and it certainly won't be the last one. As always, it is our honour to create new ways to add value for you. For more information, please call our friendly consultants at tel. +65-6224 9252 or email us at info@voplus.com.